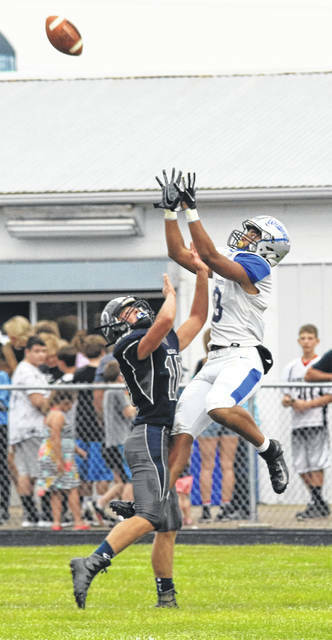 Omar Porter goes up for a pass reception for the Blue Lions in their season-opening game at Blanchester High School Friday, Aug. 24, 2018. BLANCHESTER — In a season-opening showdown between two highly-touted sophomore quarterbacks, it was Washington’s Gio Thomas who put on a show. Thomas, fresh off of winning a Division I state title with Pickerington Central last December, threw for 413 yards and six touchdowns Friday night as the Blue Lions won a shootout against Blanchester 58-42. After trailing 21-12 in the first quarter, Washington (1-0) scored 33 unanswered points to take a 45-21 lead with 5:54 left in the third. Even with the drought in scoring, Blanchester trailed by just 15, 51-36, with 8:55 left in the fourth. Washington faced a third and seven from its own 48. Thomas threw a screen pass to Dillon Steward, who appeared to be bottled up a couple of times by Blanchester defenders. However, the shifty wide receiver weaved his way through Wildcat defenders for 27 yards. Washington scored three plays later on Thomas’ sixth touchdown pass of the game, this one to Rishaun Burns, to finish off the Wildcats. Blanchester quarterback Brayden Sipple also had strong numbers, throwing for 333 yards and two touchdowns. He had just one interception, but it was a big play in the first half. With Washington leading 24-21, Sipple threw a wide receiver screen. Washington’s Steward broke on the ball but appeared to have overrun the pass. He reached behind him, tipped it up in front of him, and finally corralled the ball after about five steps. Twenty yards later, Steward was in the endzone and the Blue Lions led at the half 31-21. While most of the attention went to the two offenses, it was the Washington defense that had a strong stretch early in the game when the Blanchester offense looked unstoppable. In the first 7:24 of the game, the Wildcats (0-1) scored three touchdowns on just 10 offensive plays. In the next 22:32 of game time, Washington allowed Blanchester just 14 yards of offense and two first downs. The Blue Lions are home to take on Circleville next Friday night. In other football action Friday, Chillicothe defeated Teays Valley, 14-13, Adena topped McClain, 31-15 and Hillsboro edged Western Brown, 30-28.